This cuvee is 75% Pinot Noir from Jim’s own Rancho La Cuna Vineyard (RLC) in Los Alamos, 10 miles southwest of his winery. This is the third Pinot Noir vineyard planted by Jim Clendenen. He planted this Pinot Noir in the early 2000s. Mainly planted with clone 115 with a small amount of 828. After 10 years of production the RLC Pinot Noirs are really starting to express distinct complexity. 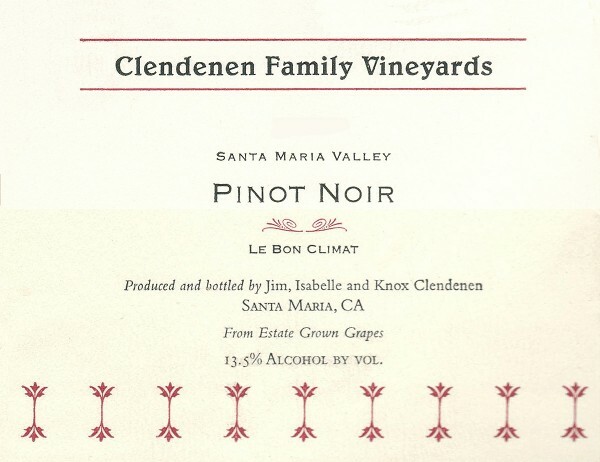 The remaining 25% of Pinot Noir comes from Jim’s own Le Bon Climat Vineyard located on the southern border of the Santa Maria Valley AVA, overlooking the Santa Maria River. The cool Pacific Ocean air runs right up the Valley to Le Bon Climat. Most days the breeze from the ocean is evident before noon. The day time highs seldom get above 85 degrees Fahrenheit, and most days the highs are around the mid-70’s. Le Bon Climat was planted in 1997 with low vigor rootstock in poor soil. This combination of factors destined this vineyard to be slow growing and low yielding.Most of the vineyard is planted with clone 667 Pinot Noir, with some 777, 115, 2A and even a little Mt.Eden clone. As with all of Jim Clendenen’s Pinot Noirs the fruit is hand-picked, and processed soon after harvest. The grapes arrive at the winery cool, are processed cool, and slowly fermented. The fermenters are manually punched down at least two times per day. We prefer manual punch downs to gently extract all the good stuff from the grapes. After fermentation, the wine are aged in 100% new Francois Frères French oak barrels for 24 months, then bottled without filtration. This wine has a few years of bottle age, and it should continue to age gracefully for an additional 10.